Written by Clive Townsend for the ZX Spectrum. Music for Saboteur II by Rob Hubbard. Saboteur! converted for the Amstrad CPC in 1986 by Clive Townsend, and for the Commodore 16/+4/64 in 1986 by Branko Špoljarić. Saboteur II converted for the Amstrad CPC in 1987 by Clive Townsend and Maz Spork; for the Commodore 64 in 1987 by Clive Townsend; for the IBM-PC compatibles in 1987 by Mike Richardson; and for the Plus/4 in 1990 by Muffbusters. Durell's Saboteur! and its slightly less known sequel, fully titled Saboteur II: Avenging Angel, were at their time a rare specimen of espionage themed games. To make the game more alluring to the young customers, you'd play as a ninja and use some limited martial arts skills, as the whole ninja thing was big during the mid 80's. This would later be even further proved by System 3's Last Ninja series, but I think it's safe to say that Saboteur started the development of stealth and espionage games, or at least made a big impact on the theme. 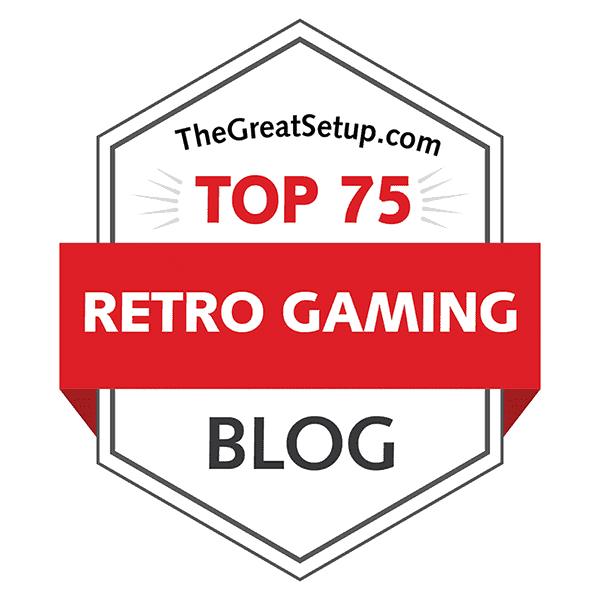 The first Saboteur has a respectable 8.37 score with as many as 373 votes at World of Spectrum, CPC Game Reviews website has given it a 7 out of 10, Lemon64 voters have given it a 6.9 with 83 votes, and the Plus 4 version has another respectable 8.5 out of 10 at Plus4world, although it has only 22 votes. The sequel has another 8.37 at World of Spectrum, although there's only 266 votes, but this makes both Saboteur games currently sharing the 47th spot in the Top 100 at WoS. Lemon64 rates it 6.6 with 46 votes, and only 6 Plus4world voters have given it 7.5. The only reviews I could find for the Amstrad version were some old magazine cuts that had given it four stars, but that doesn't say much about the current consensus. It should be noted, that although the original Twofer #3 was posted in October 2013, this entry has now gone through a rather thorough update, based on both the original January update and some new information I have come across since. UK based Durell Software has been around for 30 years now, and is currently known for their software for financial advising and administration and such things. The company was founded by Robert White, and it was one of the biggest game publishers in the early days of home computing. Wikipedia says that their biggest hit was Harrier Attack from 1983, which sold over 250,000 copies. Possibly so, but we're concentrating on a game of Durell's, that started off as something completely different. 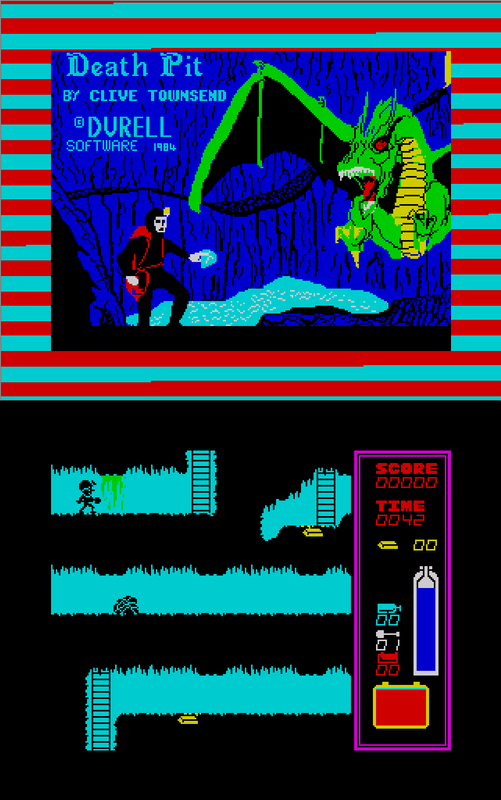 While it never came out on the machine it was originally developed on, Death Pit was Clive Townsend's first baby on the ZX Spectrum, and it was converted for the Amstrad by Simon Francis. A development version of the original Spectrum version was recovered in 2007, and by the looks and feels of it, it certainly had a lot of similarities with the game that inherited Death Pit's routines: Saboteur. While in Death Pit, you played a spelunker and collected gold in a maze like cave system, in Saboteur you're a highly skilled mercenary trained in the martial arts. I just like to call him a ninja, because ninjas are freaking cool. Your job here is to steal a disk from a maze like central security building, and escape with a helicopter. You can only carry one item at a time, which will likely be a shuriken or some other sort of throwable weapon, which will help to make the enemy guards get some much needed rest. I couldn't find any info on how big the first game actually is, but it is said that the sequel is a lot bigger, and has over 700 screens. 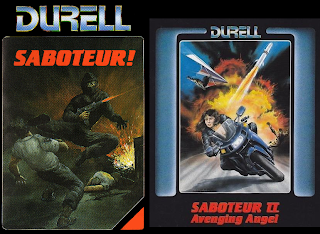 In Saboteur II: Avenging Angel, you play as the previous game's similarly trained sister, who's out to take revenge on his brutally murdered (or as the tape inlay says, fatally wounded) brother. You also need to collect that disk again from within the huge complex, along with some new tape bits from containers. When you've done your duty, escape the silo on your strategically placed motorcycle. Both games are such huge pieces of work that it'll take ages to learn your way through each of them. Of course, you could use a map, but that would make it only more difficult to stay within the time limits set in both games. I've only managed to beat both games on their two easiest difficulty settings, so I can't give you an insanely thorough comparison, but I'll try my best to go through the essentials. But exactly because they are such huge games, and have many difficulty settings, they both have an enormous amount of replay value. For a change, we actually have an interesting loading times comparison. I decided to check out as many Durell releases and other companies re-releases as I could find, because these games were released originally during a time when custom loaders were only beginning to thrive on each machine. There even were disk releases for all the computers it was officially released on, although most of them were compilation releases. Again, I have to mention that I have no real experience with Spectrum's or Amstrad's disk drives, so the emulated results are in my mind a bit questionable. If someone were kind enough to confirm or deny the results in these two cases, I'd be very much obliged. budget label Hit-Pak, both of which released the Saboteur disk versions only on obscure compilations. If the list below looks a bit difficult, it's because it kind of is. On tape, the Spectrum clearly had the faster loaders in the first game, but the Commodore version wins with the sequel. On disk, it's hard to tell, but if all the emulated disk loaders are accurate enough, I'd say the Spectrum version would be the one to go for in both occasions, although the C64 versions are most likely the easiest to find. However, since I can't confirm the loading times for Spectrum and Amstrad disks, I will not count them in the final scores. But measuring a game's worth is rarely done with loading times. A conversion's worth even less so. SPECTRUM, DURELL: 3 minutes sharp. C64, DURELL BIG 4 TAPE: 4 minutes sharp. DOS, HD: No measurable loading time. And before we get too violently drowned in text, let's take a look at the loading screens. As usual, they have no say in the final scores, although perhaps they should sometimes. Bottom row: ZX Spectrum normal and ZX Spectrum ERBE loading screen. For the first game, we have a few variations of the original loading screen, of which the original looks the most natural. Overemphasized outlines always look silly, as they do on the Amstrad version's flames. C64's loading screen doesn't have the flame for some reason, and the ninja's colouring is slightly darker than in other other versions, even when the screen luminance and palette are set brighter. The C16/+4 version doesn't even have a proper loading screen, it only shows the Novaload product number there under the game title. The red loading screen is from the ERBE versions, which looks pretty nice, but doesn't really get under my skin like the original. All three regular versions of Saboteur II loading screens have the same setup, but in different colours. The Spectrum version looks like it could be the original, from which the others were converted, but I'd say the Amstrad version looks the best, because it's darker, and doesn't have the Spectrum rainbow thingy in the lower left corner. The C64 version looks just weird, like the game would be happening in daylight. The white outlines on the female protagonist makes her breasts stand out more than they should, and the Spectrum rainbow thingy is in completely wrong colours - but then again it's not the Spectrum version, so why include it there in the first place? As an oddity, we have the Keypunch disk release loading screen at the right end, and other than having a shining animation bit, it doesn't have much to recommend itself. And finally, as you might have noticed, the Plus/4 version hasn't been included in this section, because it's an unofficial conversion, and no real media version has been proven to exist as of yet; also, the DOS version doesn't have a loading screen as such. Oh well, let's move on to the game itself. Since these games both are flick-screeners, they allow an easier path to memorize the huge maps. The thing is, the more difficult you set the game to be, the trickier it gets. This is basically how the difficulty level setting affects in both games: the easiest level will let you just find the exit and escape the building - easy does it. Gradually, as the difficulty level gets higher, the more you have to accomplish, and the harder the guards, obstacles and the platforming bits are to beat, because every time it's a new game of trial and error. And already we have a bit to compare - in the C64 version of Saboteur II, you can choose the difficulty level freely in the starting menu, whereas in the other two versions, you have to complete all the levels sequentially, unless you have a password for the later levels. But let's take a proper look at the first game first. The controls look to be rather self-explanatory; left and right run in said directions, up and down climb stairs, and fire button punches or throws a throwable item/weapon. Up also performs a jump kick, if you're standing still, and down ducks. You can also jump over things if you run first and then move the joystick up diagonally into the direction you were running. You can also throw things diagonally by pushing the joystick up or down at the same time as you press the fire button. If you find a container which has some items within, you can swap your current item (or take it if you're holding nothing) by pressing the fire button. The fire button also handles the computer terminals, which are used to unlock doors and handle lifts and such. And finally, when you reach the helicopter on which you must make your escape, go inside and push the joystick up to start it up. The controls are very responsive in all the versions, but the speed differs depending on the machine. The Amstrad version is clearly the slowest of the bunch, but the Spectrum version is not too bad, it's really almost as fast as the Commodore versions. It's only noticeable that there's not as much power to process the graphics on the Spectrum, when the screen gets heavier in detail and objects. I imagine the Amstrad version is as slow as it is, because it was as straight a conversion of the Spectrum version as possible, probably due to a hurry to get the conversion released - and so there was no code optimization whatsoever for the CPC. Every version acts similarly enough, in good and bad. When there's enough graphical material on screen, whether it's animated or standing still, everything moves more sluggishly, and makes the controls harder to time properly, making it feel more unresponsive. Even the Commodore Plus 4 version plays very much like the original, but since the Commodore 16 is such a low budget computer, some cuts needed to be made for it. Even the C16 version's manual says that although you can't, for example, use the joystick or kill the guard dogs, almost every single byte available was made to occupy to make this game possible. Sure enough, the playability has suffered quite a bit compared to the other versions, but at least it's slightly more impressive than our previous C16 entry - Commando. Be warned though - it's still not nearly as good as the manual makes it sound. This is where things start to get more interesting. I have no idea which version was developed first, or were they developed simultaneously, but all three were made by Clive himself, as opposed to having an outsider write the conversions for the Commodore machines - although, he did have Maz Spork on board for the Amstrad version, perhaps to help him optimize the code? The first thing that you'll notice is that the game has a female character, so she'll have to arrive to the scene with a more feminine vehicle - a hang glider. Of course her escape vehicle must be in the same way different than in the first game, so here we have a motorcycle. I'll get a bit ahead of myself here and hazard a guess that the C64 version was made first, and the two others were sort of enhanced from it. See, there are so many little (and a few bigger) differences in the C64 version compared to the other two, and exactly in a way that makes it feel more like a first edition of the game to the updated Spectrum and Amstrad versions. And the reason why I made this observation at this point is this: the differences start even before you start the game, and show themselves piece by piece throughout the game. Depending on your point of view, it is lucky/unlucky that the Plus/4 version was completely ported from the C64 version (this is why I will not refer to the Plus/4 version separately unless I have to). First, the menu is completely different. In the C64 version, you'll only get to choose the difficulty level, all of which are named in a very ninjaesque style. In the other two versions, you'll only get to play the harder difficulty levels if you enter a code corresponding the said level, and so you'll only get to see the level names and mission descriptions after you've completed the previous one. Otherwise, you'll get a familiar looking menu with choices for control methods, and in addition to the level code thing, you get to choose whether you want to hear music or not. Second, your ninja girl moves in a different way in the C64 than in the other two. While the basic controls are pretty much the same from the first game, they're slightly enhanced, but I'll get there as I go. For starters, when you drop off the glider, you'll drop straight down on the C64, and on the other versions you'll drop slightly diagonally, which feels more natural, but is harder to guess where will you land. The next thing you'll notice is how the girl jumps: on the C64, she'll go straight for a long spinning forwards jump, but in the other two versions, her jump is not as lengthy and has a brief diagonal movement at both ends. At least they all had the new crouch kick move implemented, and a moving kick jump, which you can do by pressing the button while moving left or right. Before moving on with this stuff, I should probably mention a thing that's an important development from the first game. While the guards and dogs... sorry, pumas still can't climb stairs and ladders, they are able to switch screens now, and can take more hits than in the first game. And this creates a bit of a problem, since you can't really tell whether you've hit an enemy or if the enemy hit you, since the sound effects are the same for each. The collision detection might be as spot on as in the first game, but your battles are mostly guesswork and frustration, except here we find ourselves having the third difference: in the C64 version alone, the player stops if doing a jump kick, and in the other two, she continues to fly past the enemy. And if you can't really tell whether you've hit the enemy, the more irritating this problem gets, the slower the game plays. But in any case, as far as I could tell, we've already got our fourth difference in the guards' weaponry, which isn't a big thing, but a difference nonetheless. A minor point here, but the enemies seem to be more fierce in the Plus/4 version than on the C64 version, so it's more difficult from the start. Fifth, you get these nice little info bits in your HUD on the Spectrum and Amstrad versions (like, "Bike arrived" or "Stash searched"), but I couldn't come across any on the C64. Another one of those things that make the C64 version feel like a prototype. consists of a huge underground maze with every screen looking exactly like the other. It's just impossible to play without a map, which brings us to our comparison's final and most important point: the playing speed, or framerate if you prefer. And this is some heavy duty comparing, so hold on to your hats. The DOS version needs to be noted separately for having some clearly unique issues. For modern PC users, the game speed will cause headache. For old PC users, it's not much better. (NOTE: the following bit for this paragraph is copied directly from my January Update entry.) One of the smallest problems you will experience is the way you have to perform your jumps. You will have to be walking in some direction, before going for the jump diagonals, otherwise you will just perform some sort of kick or other move that you were clearly not intending to do. Then, once you encounter your first enemy, you know you are in an uncommonly large pool of feces. If you ever tried to play this version, you might have noticed before this point, that your movement isn't all too fluent - your ninja girl stops for a second after having taken her first step, every single time you try to do anything. This lag effect is more painful, when you try to fight any enemy, because you are unable to move after you have made a jump, unless you restart your movement by first taking a neutral position on your controller (even though keyboard is your only choice). This same problem naturally occurs after you have performed a jump-kick. Even more annoyingly, when you try to perform something as simple as fist-fighting, tapping the action button too quickly will only cause your ninja girl to freeze with her fist straight forward without any sort of effect going for it. So, not only are you unable to move as quickly and gracefully as a ninja should, you are pretty much useless at fighting as well. With a bit of luck and practice on the bad controls, you might be able to clear the first few difficulty levels, but the probability of getting insanely frustrated at the DOS version of Saboteur 2 is too damn high. Because the map is so huge, it has taken its toll on the Spectrum and Amstrad versions. On the Spectrum, crossing a screen horizontally takes at least 5 seconds realtime, and one second on the game timer equals something between 3 and 4 seconds realtime. So, you would have approximately 50 minutes of playtime, most of which will likely be spent on finding your way down to the exit, if you've never played it before. Luckily, that's your only assignment on the first difficulty level. If you know the map at all, you'll be able to finish the first mission within 2-3 minutes. Unfortunately, the true difficulty that you're facing in the Spectrum version is the seemingly slow control responses, which happen due to the bad framerate, and makes fighting the guards and pumas really bothersome. The speed problem isn't helped at all even with the extra memory of the 128k Spectrum. The only addition is the AY music, which can be turned off, but turning it off doesn't affect the gameplay one bit. Really, the best way to experience this game would be to use some sort of accelerator, if possible (I'm not sure these even exist, but considering the current year, I'd guess they do), or turn your emulator's speed to 2x. On the Amstrad, then: One second on the game timer equals to something between 5 and 6 second realtime, and crossing a screen takes about 7 seconds realtime. The slowness also translates to having the same control response problem as the Spectrum version, but on a bigger scale. It's really just unplayable as such, so the same thing is suggested for the Amstrad version as for the Spectrum one - turn your emulator's speed up. On the C64 it isn't nearly so bad: one second on the game timer equals approximately two seconds realtime, and it takes less than 4 real seconds to cross a screen. Basically, all three versions play pretty much in the same schedule, but the slower versions require much more patience. The C64/+4 version is the only one of the three to come close to the original Saboteur's playing speed, and I'm guessing it's because the map was built with the C64's capabilities in mind first. The differences in movement aren't really such a big deal, when there's fluidity to consider. After all, the basic controls are pretty much the same in every version, only details are tweaked for the other two. Or it could also be that these detail tweaks were dropped from the C64 version to get the speed right, who knows. For both games, it's basically the same graphics engine with slight modifications for the sequel. It's apparent that the original Saboteur was developed for the Spectrum, since your movement is animated by character blocks, instead of pixels. This was a very common practice in the early Spectrum games, and even in later games such as Savage, the animation and scrolling is done in character blocks, as it made the quicker movement speed easier to achieve. And as mentioned earlier, these games are also flick-screen platformers, which could almost be considered a character trait for the ZX Spectrum, as it wasn't really all that good at handling scrolling. Then again, it made these sorts of games much easier to map. In the first game, the graphical differences are mainly in the little details, such as the fonts and different colours in objects, but in the two better Commodore versions, some objects seem to be missing. Let's have a look at a few screenshots on every system to see what else we can find. Although the menu screen doesn't have much going on for it, there's still a picture and some options. The Commodore versions look exactly the same, so there's no point in including the other one. In the Spectrum and Amstrad versions, you only get the control methods for options, and you'll choose your difficulty level after you press the S key to start the game. The difficulty will be chosen by typing in the chosen number. The Commodore versions have a completely joystick-controlled menu, which can be argued whether that's a good thing or bad. As for the picture itself, the Spectrum one has the most colour, and every version has the same picture otherwise in as much detail as I could care to have them, so the Spectrum version wins here. We already established that both the Commodore versions start without the boating intro, straight from the dock, but we can also see that there's no texture in water either, whereas in the Spectrum and Amstrad versions there's plenty. The Spectrum version has perhaps more different colours as well, although you probably can't see the green bits from the small screenshots. But it seems the less detail, the faster it works. Not that it makes much difference in this sort of graphical environment, how much little details it has, but it's nice to have some if it works good enough. We might as well compare the HUD while we're at it. The Spectrum and Amstrad versions have a very similar setup, with a nice.. umm, currently retro-futuristic font, of which I don't know the name, while on the Commodores you get the basic system font - boring. Also, instead of having this weird lightbulb-themed framing like the Commodore versions have, you get this spookier barbed wire framing. I have to say, the Commodore versions don't look all that good now, when compared closely, but when you play it, the basic looking HUD doesn't bother all that much, because your eyes concentrate more on the action screen. I think I like the slightly different colouring on the Amstrad version more than the original Spectrum version, I don't know why. It's just an opinion. You don't have to get too far in the game to notice that the Amstrad version is not only the slowest of the bunch, but also has the least amount of colours. All of the details have been kept that were in the original Spectrum version, but most of them aren't coloured any different from the rest of the background. Neither does the original celebrate its amount of colours, but it's certainly better than the Amstrad. Both higher-quality Commodore versions look very much alike in most parts, but the colouring is slightly brighter in places on the Plus/4 - but more importantly, they seem to have some ground in colour what they don't have in detail. This is kind of interesting. All versions have a different colouring on the vertical bars in these platform screens. I don't really know which one looks the best, but Amstrad's version definitely looks the least colourful. Again, it's a matter of personal opinion more than anything, but some colour coordinator with a degree might have a professional say on the matter. But I think I like the Plus/4 version the most in this case. Because there aren't all that many rounded objects in Saboteur, it took me a while to notice that the Plus/4 graphics aren't all that clean as they at first seem to be. When riding on the underground trains, you'll notice that they look strangely blocky, but it's one of the rare occasions that this occurs, and it doesn't bother all that much, considering. The original trains on the Spectrum version look icy blue, and the tunnels have this white stripe going at the bottom. On the Amstrad version, the stripe is yellow, and the trains look strangely red, like it's heading someplace else entirely. Although I do like the yellow number plate in the Commodore versions, the original with the white stripe looks the most like you're heading to dangerous area, and thus it's my favourite. When you find the room with the disk, you're already ahead of most of the players who ever tried it. For a long time, I only thought you were supposed to kill as many enemies as possible and head for the exit, which to my young head back then was as logical as anything. I still have no patience to find the bombs and place them wherever they're supposed to be set at. But now that we're here, let's take a look at the disk itself and a bit more of our surroundings. Again, the Plus/4 versions shows its blockiness to a new extreme, but it gets the job done. The C64 version looks slightly better, but doesn't quite get the shapes right in all places, if you compare it to the Spectrum and Amstrad versions. But then, Amstrad doesn't have all the colours, completely missing green from the windows, making it look almost like there aren't any. The disk itself looks fine in all versions, only the Commodore versions have a different style of disk, and each has a different colour. Spectrum and Amstrad share the same type of disk, but again, Amstrad has a slight shade of yellow instead of green. Don't know if any of this REALLY matters to anyone, but some people have proven to be rather idiotic about these things, like they have some sort of deeper meaning and says their computer "is better because that colour in that game was different in yours." Ah, to be 8 years old again. Now having gone through all that and possibly much more, you're finally ready to git to da choppah! Unsurprisingly, the Amstrad version looks as yellow as ever, but it's even missing the actual take-off platform, and instead takes off from the floor. In the Spectrum and Amstrad versions, though, there's a roof that opens up before you take off, which doesn't exist on the Commodores. It's as big as the intro animation, so any small elements missing take some value off from it. Screenshots from the Commodore 16 version of Saboteur! Finally, the COMMODORE 16 version needs to be viewed separately from the others, because it really is quite a different deal altogether. Although the manual says that some bits needed to be taken out to fit the game to the C16's memory, somehow I didn't expect it to drop half of the rooms and even half the size of the action screen. (NOTE: I did update this bit for my January 2014 Update entry, but for all the new readers' convenience's sake, here it is updated into the original comparison.) Quite a lot of the nice details are missing, such as the motion detector guns, the helicopter at the end and most of the furnishings. But still, considering the hardware limitations, you couldn't possibly expect much more from it, I suppose. Huzzah! Now that we've finished with the squeezed tour of differences between the five versions, we get to look at how they all performed. I'll have to give scores based on colours and detail, so their sums will be added in that order. And here's the high score tables, in case you were wondering. In the sequel, we have even more differences in detail than in the previous game, and even some of the moves and enemy actions look different, which I already mentioned in some detail earlier in the playability section. So, it's basically another Commodore versus the other two machines fight. I didn't include the 48k Spectrum menu here, because the only difference to the 128k one is that it doesn't have the option to turn off the music, because there is none during the game. Otherwise, you can see the Spectrum and Amstrad versions take on after the original Saboteur, and have a similar menu system with a nice picture on the side. The C64 version has a very different approach, and only features the list of missions, or difficulty settings, which they really are. But because they're named in such an intriguing way, the list alone gives the game a different kind of mystique than just having a regular menu, especially when you can't see the mission titles in the other two versions unless you know their passwords. All three versions have a different coloured hang-glider that you jump down from to infiltrate the enemy base. I don't really get the logic to give a ninja anything with as bright colours as you could think of - it just waters down the whole idea of stealth. The C64 version is the only one to have it right - it's black. The Spectrum has it bright yellow and the Amstrad even worse - neon green. But there's more: the C64 glider is the smallest of the three, and the Amstrad glider looks a bit broken from the back, like the left wing was slightly ripped and pulling to the front. But, whatever, it's such a small detail and you only see the glider at the beginning that it's hardly the biggest thing from this game to make your day miserable. Also, probably worth noting at this point is the HUD, which is very brown in the C64, but is somehow more stylish than in the previous game, and surrounds the action screen as well as the information bits at the bottom. The versions on Spectrum and Amstrad have the same barbed wire thing going on that was in the first game, but is limited to only the information bits. The fonts are the same in all cases as in the previous game. You don't see any anti-personnel guns hanging from the ceiling in this game, but there are some weird vampire bats in the underground cave labyrinth, which fly in varying speeds and patterns and can drain your energy quite quickly if you don't watch your steps. It's hard to see them in the game as it is, so I didn't take a screenshot of them. But then there's the pumas, which replace the dogs from the first game, and you can even get some points from killing the pumas, whereas from the dogs you didn't get anything, because hey, who'd be so cruel as to kill a dog, right? Then there's the guards, which are actually androids, which explains their inhuman strength. In the Spectrum and Amstrad versions, they carry flamethrowers, which I've never seen in the C64 version - another clue to point out that it must have been an unfinished product or a prototype that was finally released. Most of the new room elements are missing from the C64 version, but it has some desks and cupboards. The other two have some trees in the sections outside the building and some bookshelves, tv-screens and whatnot. So the C64 version is definitely a less detailed version of the game, but perhaps because of it, plays that much better. Then again, there's some elements in the C64 version that don't exist in the others, like these windows. The lifts don't look or act that much different, but some nitpickers might find it interesting that the C64 version marks the floors from A to Z downwards, and the other two have it the other way round. Here again we have the same problem as we did with the hang-glider - I really think ninja equipment should be as unnoticable as possible, and for some reason, the Spectrum and Amstrad versions have these unholy red and blue/green bikes waiting for you. Then again, the tunnel where the bike is located is lit with red lights, so maybe the red colour was supposed to be a reflection of the lights, but it's just too bright for that. If I were the enemy, I would've blown the damn thing up before you reached it. The C64 bike is black as night, as the cover art suggests it to be, but there's no red lights either in the escape tunnel. Since the lights do not actually add anything to the lighting of the tunnel, it's all the same, since it's just decoration. I have to admit the C64 version looks for the most part an unfinished product, but some things like the black hang-glider and bike look their part more than in the other versions. But it's because it runs so good that this lack of detail doesn't matter as much as it should. The Amstrad version suffers again from a lack of colours, so apart from the loading screen, the Spectrum version looks the best in detail, but it's a shame you have to play it on an emulator to make it run as fast as you would wish for it to. The palette is another matter entirely, and as it is really more a matter of opinion, I can't really say one way or the other based on the way I like to have things look in the gaming world. I might say, though, that the C64 has the palette more correctly corresponding reality, so I guess I'll have to prefer that one. Long after writing all the above and posting this entry, I found out about the DOS version of Saboteur II, which shall be now taken a separate look at, because I'm feeling a bit lazy about doing a proper job of updating this entry. Screenshots from the DOS version of Saboteur II. As has been said elsewhere, the graphics in the DOS version are basically very similar to the Spectrum and Amstrad versions in terms of animation and detail, but are horribly mutated in terms of colours. Considering it's from the EGA time, it really had no option but to look bad, but didn't they have any other colours to consider? Now the colouring reminds me of a really bad 80's b-class ninja movie. So it seems to get all the good stuff, you must deal with the bad ones as well. Even longer after finding the DOS version, I found out my mistake of not writing about the Plus/4 version into the original entry without any outside help, so here's a completely new screenshots update. Clearly, it is not far from the C64 version. Some things are darker here, some things are brighter, and I kind of like some of the new shading effects here and there. There are some graphic bugs here, however, which might cause some headache - although I'm not entirely sure if some of them can't be helped due to the hardware. One of the issues is that you can fall and stand on the moon, but I haven't found it to cause any trouble in a bigger scale. The other graphic problems have more to do with screen update - sometimes the sprite overlays disappear and get unmasked somehow to reveal a brown background layer for a fraction of a second. This happens stupendously often. Due to this, I will have to place it lower than two of the more furnished versions. As a final note, the Amstrad has both games in green screen version and colour screen version, and in both cases, the green screen version is just as colourful, only lighter in hue. I'd say that's the better option all around, because the colour versions are slightly too dark, and sometimes the enemy sprites can be a bit too difficult to see against the dark night skies. This has no effect on the final scores, but it's an interesting choice to have. Neither of these games are known for their immensely loud and wonderful soundtrack or for their huge array of special sound effects. That wouldn't be very natural for a game that's supposed to play with the idea of stealth action, now would it? That said, the original Spectrum version of Saboteur has a memorable, slightly funky theme tune. Too bad it's a single note beeper thing. The version on the Plus/4 doesn't fare much better - it's the same thing but in a strangely high tempo. The Amstrad gets to shine a bit in this case: it's the best version of the original theme tune on any computer. But what's even more strange than the high tempo of the Plus/4 version of the original tune, is that the C64 version has a completely different tune, that sounds closer to the C64 Barbarian theme tune, which isn't necessarily a bad thing; it's just very different. As strange as that is, even stranger is that the C64 version of Saboteur II didn't have any theme tune at all, although it was made by Rob Hubbard, and can be found on the internet as a .sid music library file. The tune was, however, ported for both the Spectrum and Amstrad versions, of which I definitely like the 128k Spectrum the most, as it resembles the SID version the most. Naturally, the 48k version only has a beeper version of the tune, so it's not much better than not having one at all, unless you're a weirdo and somehow really enjoy the one-channel beeping. As for the sound effects, I'd say we've got a bit of a mixed bag here, and I'll give them in a machine-specific order this time. C+4 S1: Running makes your feet tap against the floor, there's some fighting noises, using a computer terminal makes a short beep, and flying the helicopter makes the fighting noise effect in a repeating fashion. Not bad, considering. C16 S1: No sounds at all. C64 S1: A lot of sounds here: a strange metallic clashing when you're running, anti-personnel guns shooting, hand-to-hand combat sounds, turning switches on control panels, taking an underground train, placing a bomb/picking up the disk and finally, the helicopter noise - they're all singular. C64 S2: Doesn't sound too good, this. Only two sound effects for the whole game: one that goes for every sort of collision, whether it be your body to the ground or your foot to an enemy guard's face or a shuriken into a puma's head; and the other one for picking up the tape bits and other special objects. Well, let's see how the other two have it. C+4 S2: Nothing. Just... nothing. CPC S1: Otherwise, the effects library is quite similar to the Spectrum version, but the Amstrad has two differences: there's actually an effect for STOPPING the underground train, and the other was the lack of any effect for getting the disk. CPC S2: There seems to be only two sound effects here as well... no, actually make that just one. There's a loud version for anything resembling a more actionesque action, and a quiet version for your running. This is really hopeless. DOS S2: Well, at least there are some effects, unlike in the Plus/4 version. All of it is just random bips and bops, though, which you are barely able to hear, but that's not too far from all the other versions, really. SPE S1: Running makes a quiet tapping sound, killing an enemy guard gives a big noisy effect, anti-personnel guns give a semi-loud pop sound when they shoot (the same as when you drop from a bigger height), and picking up the disk gives a weird unique chirping noise. SPE S2: Running makes an even quieter tapping sound, and every other thing seems to make a weird "tshhp" noise. I can't really call it all that much better than the C64 version, if at all. So, how do we put them in order? In these kinds of games, the little what they have of sound effects, the quality of them is immensely important. Music isn't as much, but if there is any, it'd better be worth a listen. So let's add it up, then. Note that the C64 version of Saboteur II gets one point for music just because it exists, although it wasn't released in the game itself. These two games aren't ones to compare with only an introductory experience, which was why it took so long for me to finish this one, and I wanted to do both games at once, because I feel they have a similar type of belonging together as, say, the Max Payne games or the first two GTA games, or even the first two Doom games. They were two products of their time that were a clear mark of progression of the same theme, with a slightly evolved engine to make the second game feel so much more than the first, and yet, all of the games I've mentioned have that similar feel to them that the first one was still better than the second, and you're not just quite sure why. Starting the presentation of the final scores, we'll start with the first game first, as is logical. Naturally, mathematics take precedence now, as far as they can make themselves useful, if at all. So again, it's not all that simple. I really was surprised of the quality of the +4 version, and I might even place it as high in my personal opinion list as the other two at the top. But you know, this is not really all that comprehensive a comparison as it could be. These results could vary slightly still, had I played them all completely through on the hardest settings. Moving on to the sequel, then. And it's not that much different this time either. Since the Spectrum had two different versions released, one for the 48k machine and one for the 128k, the scores will show them in the same row, separated by a forward-slash. And there you have it. For once, a truthful mathematical conclusion to a matter which is driven mostly by opinions: the Spectrum versions either are the best, or they aren't. Considering how long the Amstrad versions load from the tapes, they should well be worth the load, but aren't, really. Unless of course you've never played the other versions, which would be very singular indeed. The first Saboteur is a brilliant game in all formats, and should be in every self-respecting collector's possession. The sequel is not a bad game either, but is too huge for its own good. The better versions were released on computers that are too powerless to give them any justice, and the C64 version has less to give, but is more playable on an unmodified computer. Clive Townsend worked on two more incarnations of the Saboteur saga, neither of which came to fully exist. The closest to being another Saboteur game is probably The Reaper from 1990, released by Ubi Soft in 1991, but it failed to gain much attention. Last year, Shadow Team published an unofficial sequel to the Atari STe called Saboteur III: The Egyptian Mission, but I couldn't get it to work. Here's the link to Atarimania page of the game. Again, I want to give you a reminder that this entry has gone through a relatively huge update, so if you spot any inconsistencies or illogicalities in the text that I might have overlooked, you're entirely welcome to leave a comment about it. If you want to see the original update, head over to the Heaps of Updates! entry. There might be some bits in there that I didn't put here. Hope you enjoyed it; see you next time, whenever it may be! It gets even worse in your scores where you only mention the C16, even if you seem to meen the +4. The score for the Amstrad seems much to low. The only bad thing about this version is the slower speed. But compared to the other systems it has some advantages too. In my opinion its score should be much closer to the C64/Speccy scores. Shocked? Well, first of all, thanks for getting me out of my holiday off the blog, buddy - I suppose this gives me the right to address your accusations with a similar attitude. I know I have made some errors in this particular comparison, and some of them have been corrected for an update article I posted in January. I haven't bothered to update the original article, because I trusted my readers enough to draw their own conclusions. Frankly, I'm shocked some of you focus on single games and attack if something is horribly wrong, even if (most of) the errors have been corrected later on. Even worse, post their comments anonymously. As for the Amstrad version, sure, it's not nearly as bad as the worst of the lot, but being slower than the others is plenty enough reason to place it lower than the better ones. Would you care to enlighten me as to the advantages of the Amstrad version, then, since you seem to know so much more about it? Anyway, thanks for the reminder that some people don't follow the blog quite as closely as I attempt to write them. I will try to correct my mistakes as much as possible later on, when I truly get back from my holiday. Please take a look at my other comment from today for my apology. Again, I should have chosen my words (for my first two comments) more wisely. I'm sorry about that. Regarding Sabotour, well I did actually see the update link, but I clicked on it and scrolled down to the Saboteur 2 (Dos version) cover. I belived this to be the start of the Saboteur related part of the update. I did not see that the Saboteur update started before that section. Again, I'm sorry about that. Maybe you could use an HTML anchor tag to jump to the specific location on the page. That would have been really helpfull in this case. The advantage of the Amstrad version (compared to all other versions, except the Spectrum version) is, at least in my opinion, the graphical level of detail. You mentioned some of these things in your article (water texture for example). I always felt this adds a lot to the overall atmosphere of the game. Hey, comments are very welcome, as long as they have been written with consideration, so go ahead and comment as much as you like. As I replied to the other comment, apology accepted. When something you love gets somehow attacked, people tend to take inconsiderate actions, and I'm sorry to say it's quite a widely observed form of behaviour. I'll take your advice into consideration, and will make changes into the code as much as I am able to.